If you are of a certain age in Kansas City, you probably remember the Foolkiller – a group that offered open mics, concerts and discussions groups in the 1970s. Even if you aren’t, an upcoming event devoted to its history is sure to be entertaining. Hyde Park’s Pilgrim Chapel is inviting the community to celebrate the history and ongoing legacy of the Foolkiller on Sept. 27. The event is billed as an afternoon of storytelling and performance. The Foolkiller began in 1970 in a tiny storefront on 31st Street that was reported to be a former chicken plucking factory. That space soon became the center of intense creative cultural activity. The Foolkiller members maintained a manic schedule that included year around performances, generally featuring a folk-opry every Friday and Saturday night, open mic walk-ons, and concerts by local or traveling musicians. Following almost every weekend folk-opry, there was always a house party that included plenty of food in the kitchen, political argument in the dining room, an open acoustic jam session in the living room, and occasional hour-long Virginia Reel dance-a-thons. Parties regularly lasted until dawn. 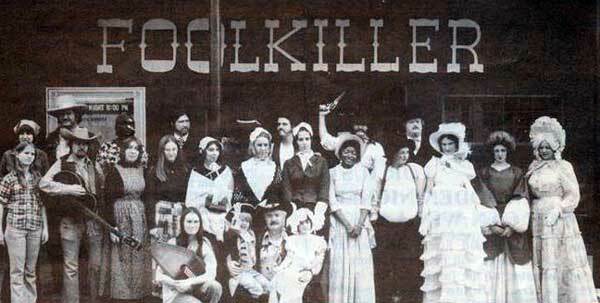 In addition to music and theatre, The Foolkiller folks also opened two live haunted houses, among the first in Kansas City. Using money earned from the haunted houses, The Foolkiller made a down payment on a building at 39th and Main in the early 1980s. The manic schedule continued a few more years—including open discussion groups, a film series, weekend cultural conferences with invited writers, playwrights, and social activists, and guerilla street theater—but when upkeep of the building became too much of a burden, the building was sold, and The Foolkiller evolved into CrossCurrents of Culture and continues to perform around town. 4:00 – 5:30 p.m., Pilgrim Chapel, 3801 Gillham Road.